Annapolis, MD — Larry Hogan just dropped his first ad of 2018, and it looks like he’s planning to run a campaign filled with hoaxes and distortions. This represents the Governor’s latest attempt to run away from his record of standing with his conservative allies instead of standing with working Maryland families. Hogan’s campaign ad tries to rewrite history, so let’s set the record straight. Hoax: Governor Hogan claims he returned $1.2 billion to taxpayers in tax cuts, fee reductions and lowered tolls. 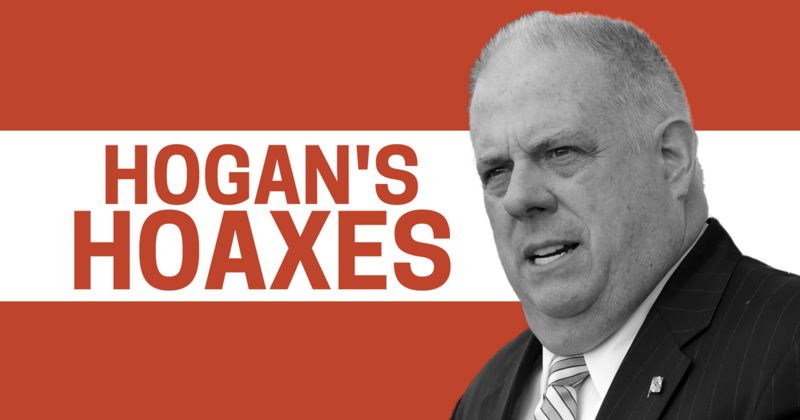 Fact: Hogan has not passed a single substantive tax cut for Marylanders, despite his many promises to do so in 2014. Also, Hogan’s toll reductions are his attempts to distract voters from the fact that he wants more tolls on Maryland’s roads, not less. Hogan’s proposed High Occupancy Toll (HOT) lanes on I-495 and I-270 will cost more than $40 for a one-way trip from Frederick to Shady Grove. Hoax: Governor Hogan claims he has funded education at a higher level than ever before. Fact: Governor Hogan’s very first budget attempted to cut more than $200 million in public school funding. Also, Governor Hogan has diverted more than $1.4 billion in casino gaming revenue from public schools to other items in his budget. Hoax: Governor Hogan claims he was there when Baltimore needed him. Fact: Months after many young people in Baltimore cried out for help and opportunity during the unrest following the death of Freddie Gray, Governor Hogan cancelled the Red Line public transit project—throwing away a decade of work and nearly $1 billion in federal funding. Nonprofit executives and developers in Baltimore have blamed Hogan’s decision for slowing down economic development in Baltimore, including in the city’s most poor neighborhoods. One year after the unrest, Hogan tried to cut funding to the vital Safe Streets violence reduction program. And after Hogan held a big publicity event to promise that he would tear down 4,000 vacant homes in Baltimore over four years, he’s breaking that promise as well—18 months in, an investigation found that only 131 houses had actually been demolished. Hoax: Governor Hogan claims he is bringing jobs back to Maryland. Fact: Maryland’s economy is failing to keep pace with the region, and Maryland is now the only state in the nation with a negative economic forecast, according to the Pennsylvania Federal Reserve. Under Hogan, Virginia workers have taken home more than $7,000 in increased wages than the average Maryland worker. And last year, Facebook, Nestle and Boeing chose to invest in Virginia instead of Maryland. Hoax: Governor Hogan claims he helped restore the health of the Chesapeake Bay. Fact: While Hogan takes credit for improvement in the Bay, this was achieved through the hard work of his predecessors, and he is working to give away that progress. Hogan is bowing to big businesses and failing to properly enforce environmental violations, while prosecutions of environmental crimes have reached a 20-year low.